Emerald at the Landor Theatre was a rather special occasion in the From Page To Stage season that is running at this Clapham cockpit of musical theatre creativity. Whilst (only) a rehearsed reading from the book, it was nonetheless a pitch perfect delivery of the show’s musical numbers, in a performance of such fidelity that it could have easily passed muster as a top notch radio play, such was the company’s vocal excellence. The programme documents Emerald’s extensive workshopping to date, however the show remains very much in development and as a story it sits fairly and squarely in the shadow of Bill Forsyth’s 1983 movie, Local Hero: Big corporation seeks to exploit local village to exploit oil/gold resources and the villagers win. Forsyth’s story (albeit Scottish, whereas Emerald is set on the Irish west coast) was more magical and whimsical and Chris Burgess’ book and lyrics for the most part fail to enchant and transport in the way that good musical theatre should do. The writers say in a programme note that the tale transcends nationality, going on to say, by way of example, that one does not need to be Argentinian to appreciate Evita. Whilst they have a point in principle, their comparison is conceited. Evita was majestic and global, Emerald is compact and parochial, with a story that lacks originality. Notwithstanding, Nikolai Foster has worked his usual magic to achieve some beautiful sounds from this outstanding troupe. 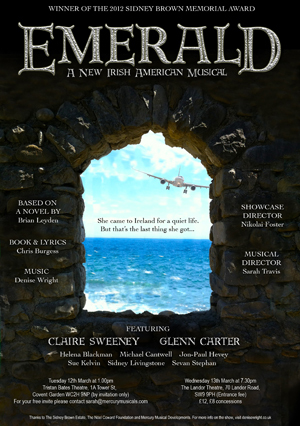 West End leading lady and former soap star Claire Sweeney heads the cast as Grace, a New Yorker who journeys to the Emerald Isle in search of her roots. Sweeney is one of the few Brits who as Paulette has played an Irishwoman in the USA, in Legally Blonde and here reverses nationalities to play a Yank in Ireland. She has a large singing role in the show and two of her duets above all stood out, Everyday and I Never Wanted To Want You, the latter, with love interest Mulcahy played by the muscular and gorgeously voiced Glenn Carter, showing a real vocal chemistry between the singers. Helena Blackman put in the finely voiced turn that we have come to expect from this Maria finalist, her Hopeless was wonderful, whilst her paramour Oliver, played by Jon Paul Hevey , was an absolute aural delight as a hopelessly idiotic young Irishman in love with her. The surprise performance of the night came from veteran Sidney Livingstone as elderly villager Theo, who struck emotional gold with his beautiful number First Love. Sarah Travis puts in a fine shift at the piano, with playing that was at all times perfectly nuanced, but the star of this reading is Nikolai Foster, who brings every voice to a perfect delivery and whose company work was stunning with some incredibly structured harmonies in the ensemble numbers with Black Pig in particular being a song that was spine-tingling to listen to. It is hard to discern if there is a broad commercial future for this show. It needs a producer to take it on to the next step and its book needs some serious stiffening up. The production also needs to break away from the Local Hero mould to provide a more stimulating and unique journey. Nonetheless, as an opportunity to peak “behind the scenes” at some industry greats working hard to support the development of new writing, the evening was a privileged treat.